Uncompromising quality. Exceptional value. All-Natural vodka. Pristine – perfection in a bottle. Vodka enthusiasts, take note – We’d like to introduce you to an all-natural vodka so clean, so pure, it could only be called Pristine. If you’ve been searching for an award-winning, all-natural vodka with unparalleled smoothness and discriminating taste, look no further than Pristine. From start to finish, Pristine is Vodka Perfection. Crafted and bottled with love and pride in Ukraine, Pristine is an up-and-coming, award winning, premium vodka brand that embodies all of what makes Eastern Europe the vodka capital of the world. Pristine Vodka finds its roots high in the Carpathian Mountains, in the south-western corner of Ukraine. The Carpathians are known for their pure and delicious thermal and mineral waters. During prehistoric times, this area was at the bottom of the Pannonian Sea, which covered most of central Europe. The Carpathians rose from this ancient seabed, and now boast unparalleled natural beauty, and a complex geography, with a distinct and rich mineral composition, all thanks to the remnants of the sea. The gem of the segment of this mountain range – known regionally as the “Eastern” Carpathians – is the ground itself. The Eastern Carpathians contain both volcanic and sedimentary deposits. The sediment filters and flavors the natural springs, leaving water so pure and refreshing, you’ll never find it’s equal anywhere in the world. Additionally, the remote location of these mountain springs means they are also untainted by man-made additives that can leach into the water-table, such as pesticides, antibiotics, fertilizers, and waste. This natural wonder sources the crisp, unadulterated water. What Makes Ukrainian Wheat So Special? Ukraine is home to the finest agricultural soil – chernozem. Also known as “black soil,” chernozem retains moisture better than most soils. Because it is loaded with an abundance of minerals and nutrients as well as humus, chernozem is also incredibly fertile. Humus is the naturally composted remains of plant life, broken down by microorganisms. Ukraine has a full third of the entire world’s chernozem. Ukraine grows the highest quality grains on over 80 million acres of unspoiled arable land containing chernozem. The general climate, with warmer winters and rainy summers, is also favorable for growing superior crops. Ukraine’s thriving agricultural industry has taken notice of these exceptional environmental factors. They’ve ensured a high volume of the finest quality organic crops, adhering to strict standards regarding pesticide and GMO use. The crystalline Carpathian spring water, rich soil, in addition to the abundance of lush, golden wheat, combine to make Pristine an obvious leader in the all-natural vodka market. Mother Nature has the best ingredients. We just craft them into flawless , all-natural vodka. Using a secret recipe refined over four decades of experience, Pristine’s master distiller uses a gravity filtration system to create an all-natural distillation method. This meticulous process further enhances the texture and flavor of the vodka, bringing Pristine to the next level of purity. Served straight or blended seamlessly into your favorite cocktail, you’ve never had a vodka quite like this. But to truly appreciate the luxurious taste and texture of Pristine, we recommend sipping on the rocks. You’ll notice the subtle aroma of creamy vanilla, followed by textures and flavors of river-stone and spiced fruit. A gentle yet striking warmth reminds you that you are in fact, drinking a distilled spirit. It finishes with a crisp cleanness that will leave you saying, “Ahhh” and “Whoa,” probably in that order. The best, all-natural vodka ingredients. Meticulous craftsmanship honed over 40 years of experience. The love and pride of Ukrainian tradition. 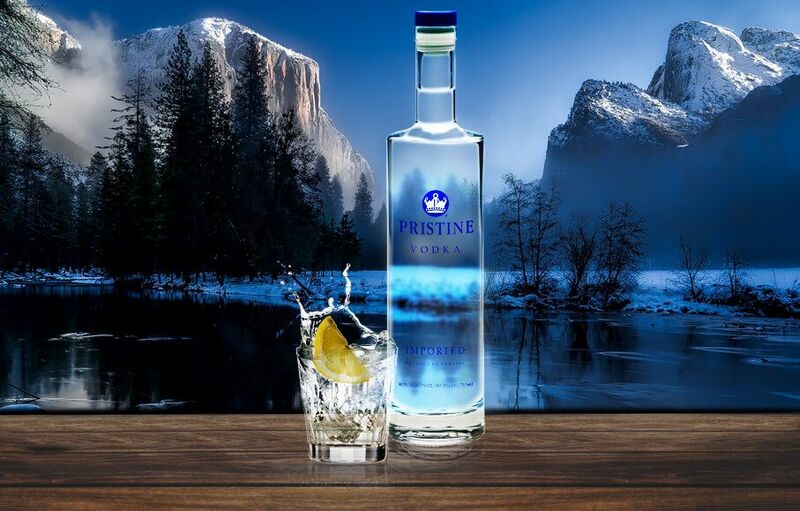 Pristine is a rising star in the world of premium vodka – an unparalleled drinking experience and an exceptional value. Visit our “Where to Buy” page to find a retailer near you. Pristine – perfection in a bottle.